It’s that time of year! 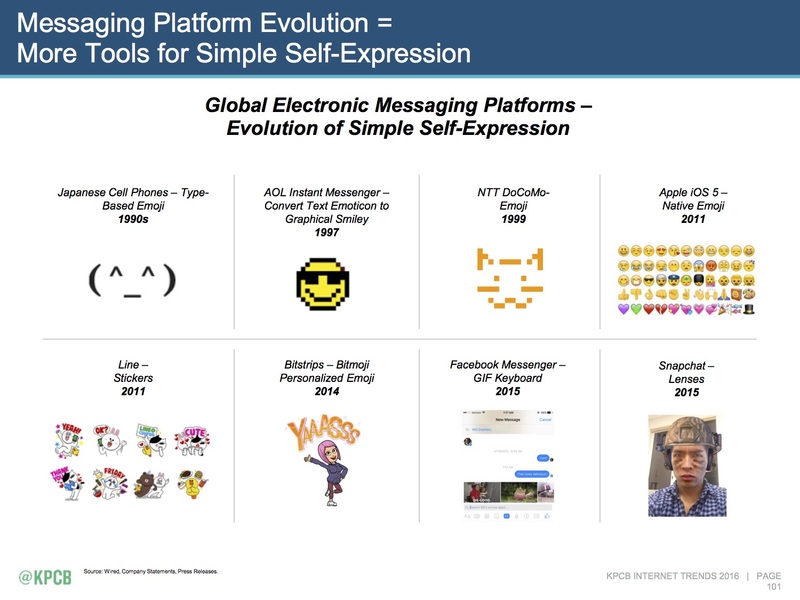 Time for Mary Meeker’s Internet Trends presentation, which this year clocks in at 213 slides. 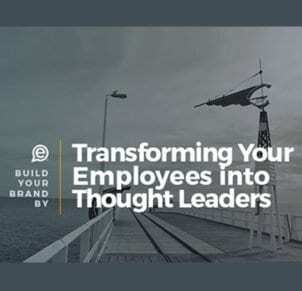 In this post we’ve summarized the top 12 trends you need to be thinking about. News flash: the world is continuing to change, big-time, more so and more quickly than we likely know. Asia, Android, video, images, messaging, and India are some of the drivers. Let’s jump in. 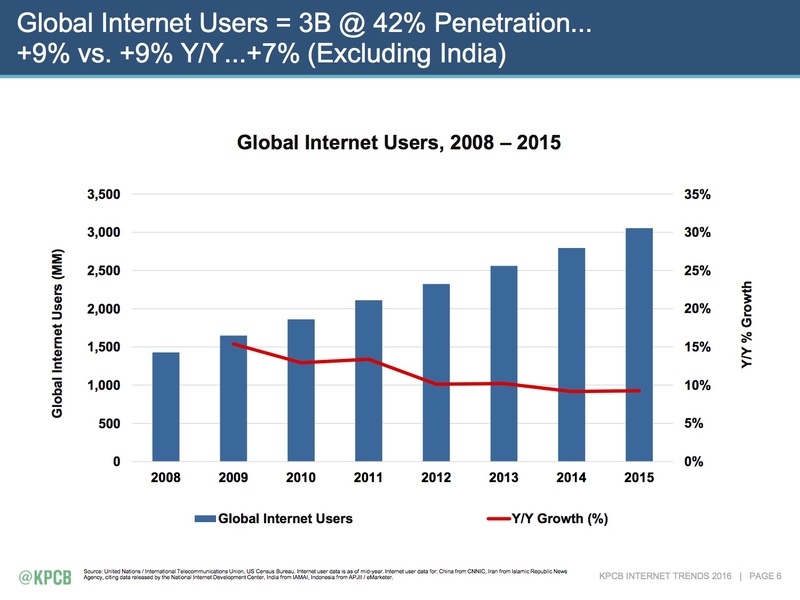 Hard to imagine (maybe not), but we haven’t even reached the 50% mark for global internet users. You can probably see why Facebook and Google want to deploy drones to beam Internet to places like Africa. At present, North America, Europe, and China are largely saturated. India is up next, along w/ the rest of Asia Pacific. In 1995 there were 35M internet users, primarily in the US and western Europe. Today there are 3B, primarily because of China. India is up next. 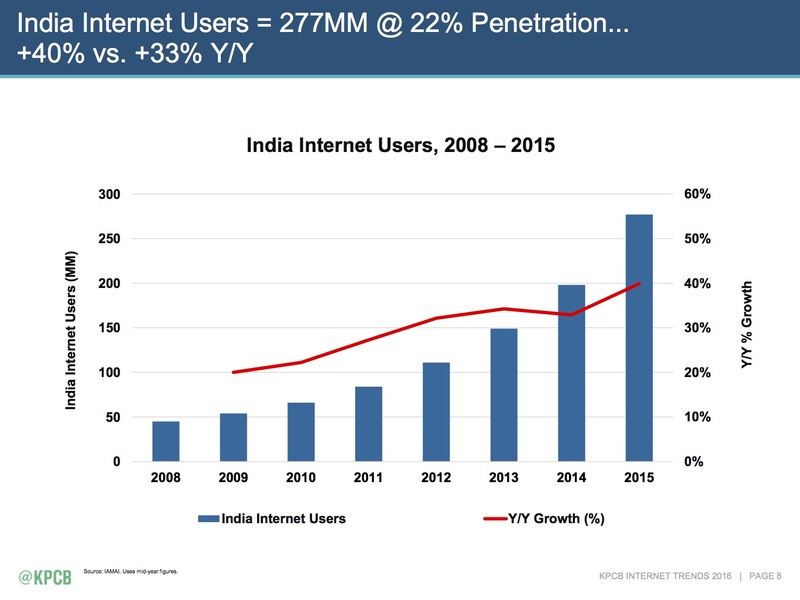 In fact, India recently surpassed the US to become the #2 global internet user market behind China, and its growth is continuing to accelerate (over 40% year-over-year). To give some perspective, at the end of 2015 only ~20% of India’s population was connected. Five years ago the number was 7%. Global smartphone adoption may be slowing (currently at 21% year-over-year, globally), however as marketers we should be very aware of the fact that the US/Canada represent a small fraction of total smartphone users (somewhere around 10%). 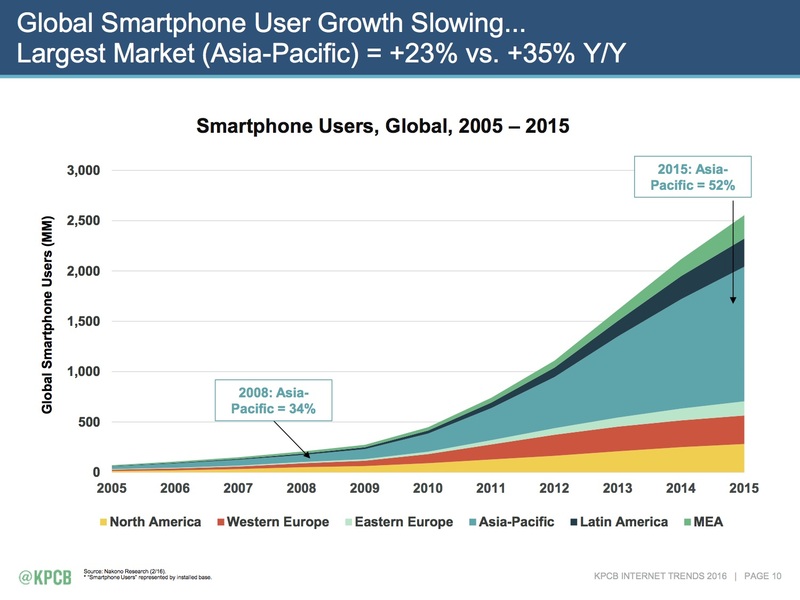 Currently, over 50% of global smartphone owners are in Asia. In 1985, over 63% of global GDP ($19T, at the time) came from North America, Europe, and Japan. 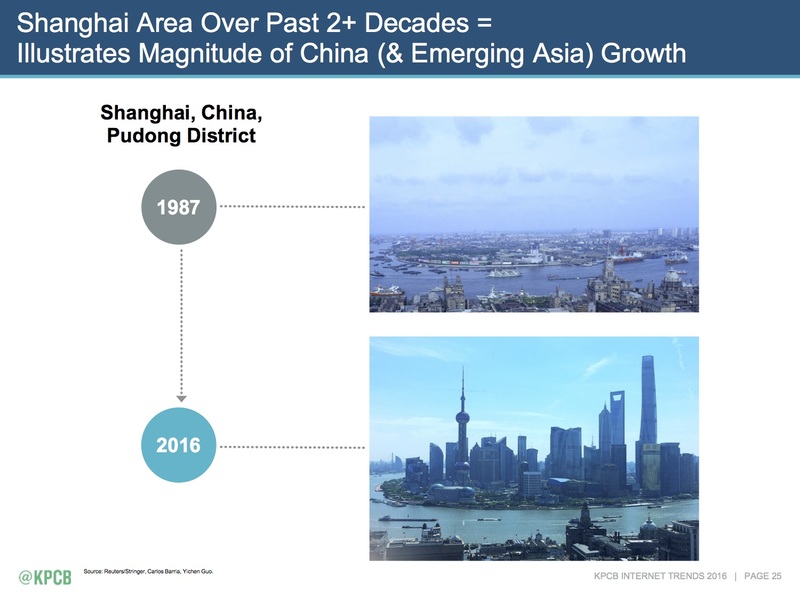 In 2015, 63% of global GDP (now $114T) came from China and emerging Asia. To put it into perspective, below are photos of Shanghai, China taken in 1987 and 2016. The amount China spent on infrastructure alone in the last six years (2010-2016) surpasses what they spent in the previous 30 years (1980-2010). As an Apple/iPhone customer for many years, it’s hard to imagine that there are more than 5x as many Android phones being used globally. 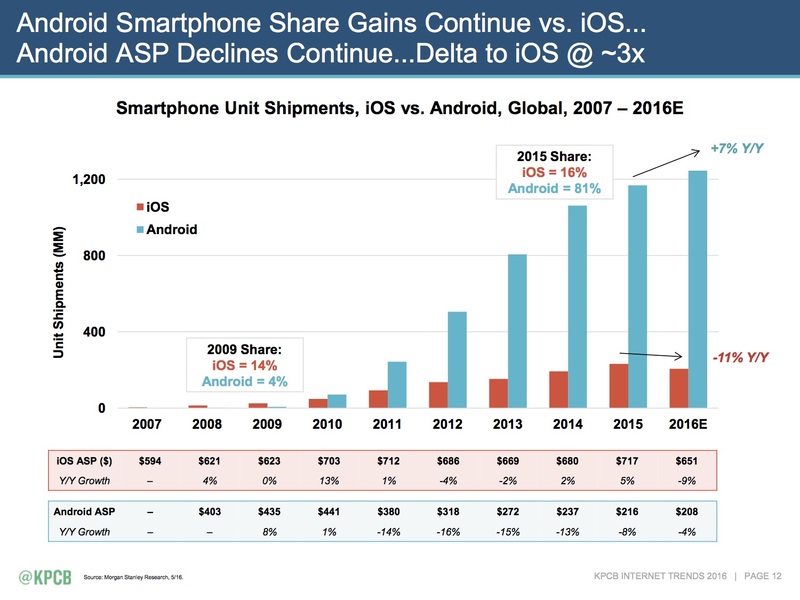 Further and for the first time ever, iOS phone shipments actually declined last year, while Android device shipments continued to grow by over 10%. Something we should all be thinking about vis a vis our mobile strategies. If you’re a marketer, chances are adblocking software hit your radar in the last year or two. A double digit percentage of internet users employ these solutions; some sites report ad block usage as high as 40%. Well, we have some bad news for paid advertisers: it’s getting worse. 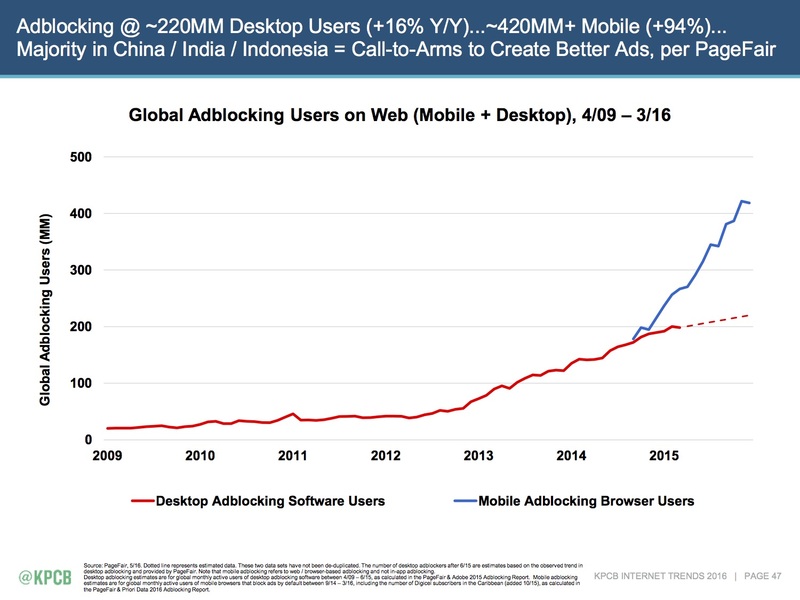 There are now more people employing ad bloc solutions on their mobile devices than there are on the desktop. No wonder “native ads” are all the rage. 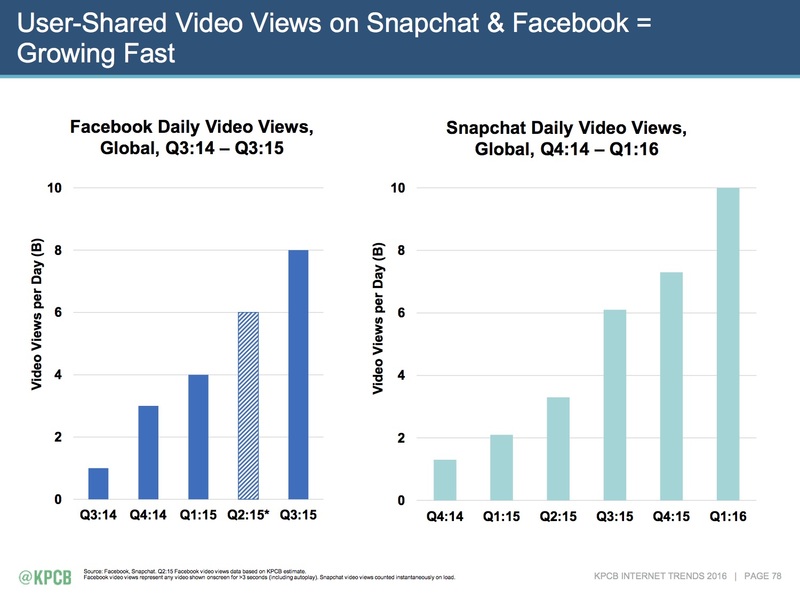 Consider this for a moment: there are 20% more video views per day on Snapchat than on Facebook. In total, Snapchat received 20B (that billion w/ a B) video views PER DAY in Q1 2016. Based on their growth, that likely means they’ve reached something like 12-13B views per day at present. Amazing. 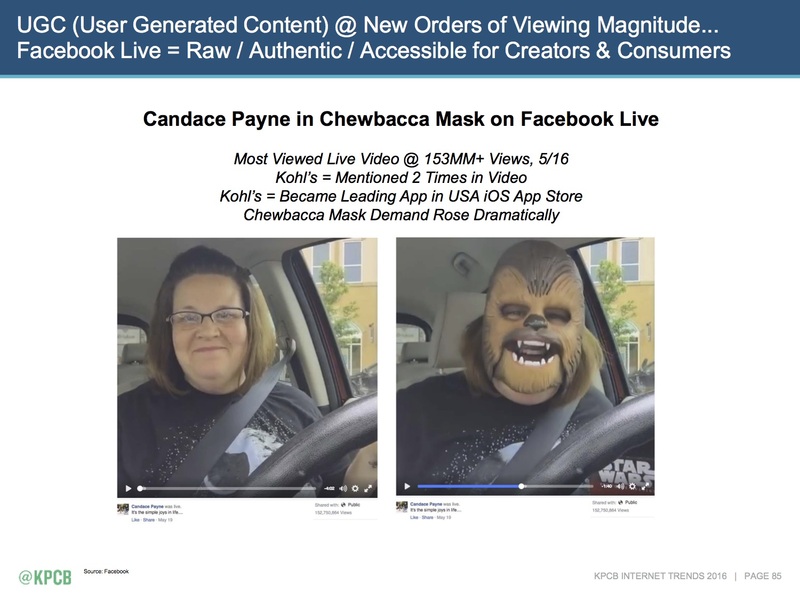 Remember that lady in the car wearing the Chewy mask? Well, it was the most viewed Facebook live video of all time, with over 153M views in ONE DAY. Further and because she mentioned Kohls a couple times, their app (the Khols app) rose to #1 in the US iOS store. 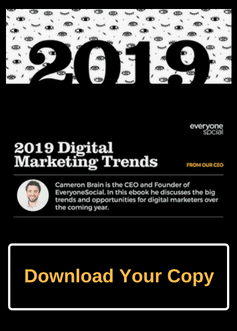 Visual mediums are dominating shared content on the internet and there are really only two companies that generate the bulk of shared photos: Facebook (Messenger, Instagram, WhatsApp) and Snapchat. 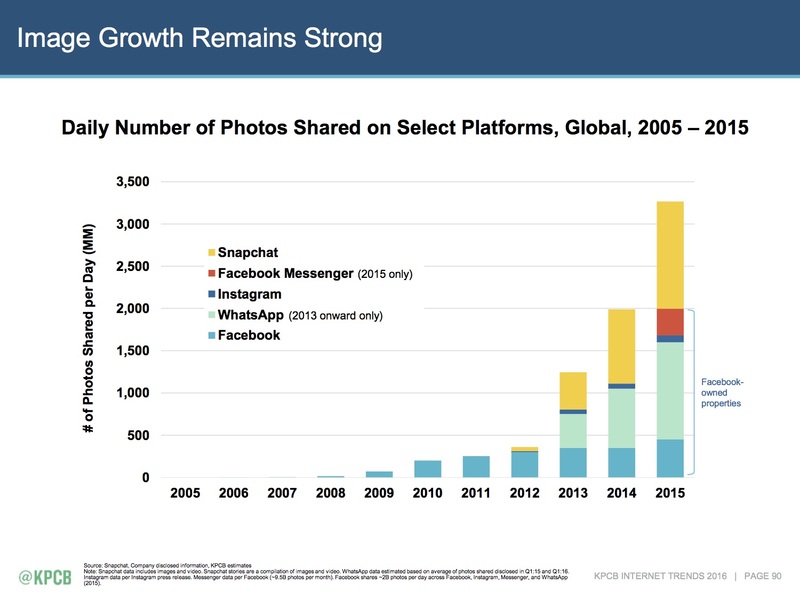 Over 3.5B images are shared on a daily basis, up 15x from only five years ago. 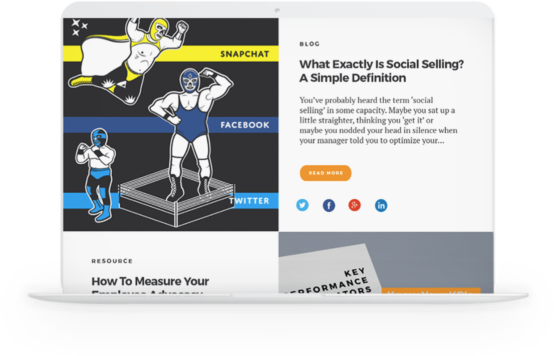 There should be no doubt in anyone’s mind that the internet is becoming increasingly visual. 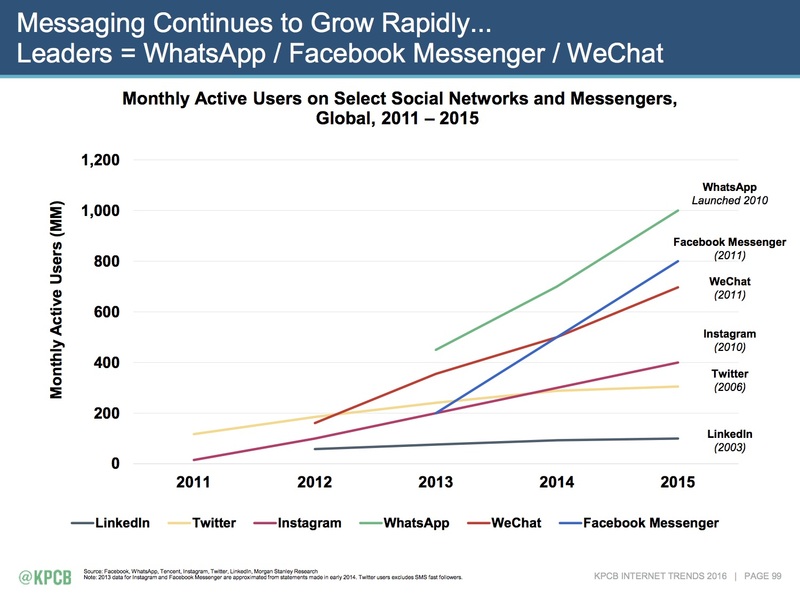 Hard fact: Twitter and Linkedin not only have the least number of monthly active users, combined they don’t even reach the top three (WhatsApp, Facebook Messenger, and WeChat). 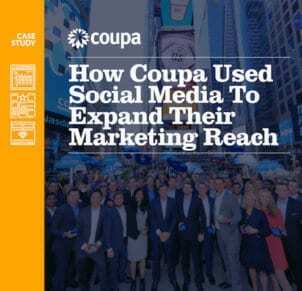 While growth has largely plateaued with the former, the top three plus Instagram continue to see 25% annual growth. Remember when Facebook paid $1B for Instagram? It’s now worth >40x that. 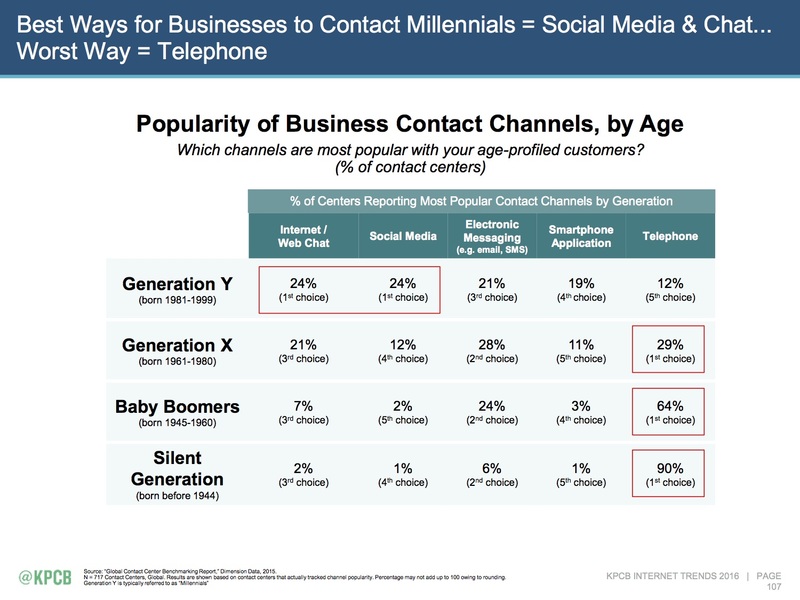 Pretty simple: when contacting/communicating with a company, those born after 1981, those wonderful/elusive/confounding Millennials, prefer social media/internet/web chat to any other channel, chiefly phone, an app, or email. 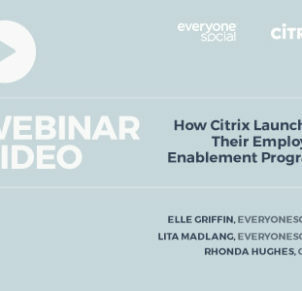 Social isn’t simply an entertainment channel, it’s increasingly becoming THE channel for communication, business, transactions, and everything else. Let’s get real for a minute. Global debt (especially government debt) has grown significantly: it’s currently 3x what it was in 2000. Further, overall global debt is now 299% of gobal GDP. Couple that with slowing economic growth rates and we’ve got much slimmer margins for error. Easy growth, at least for the time being appears to be behind us. However, where there are risks there are also opportunities. Specifically opportunities for businesses to innovate, improve efficiencies, pursue lower price models, create new types of jobs and products and technology and the internet are the drivers. One other with a connected global population, the time it takes for a new business/product/service to hit the size and scale of older players is significantly less. 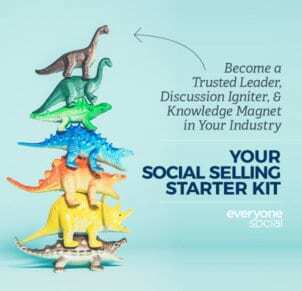 As a marketer, these are the kinds of things we need to be aware of. Our obligation is to see where the puck is going, not simply reacting to where it is. That destination is where the opportunity is. Hopefully this post gives you some ideas. It has for us.